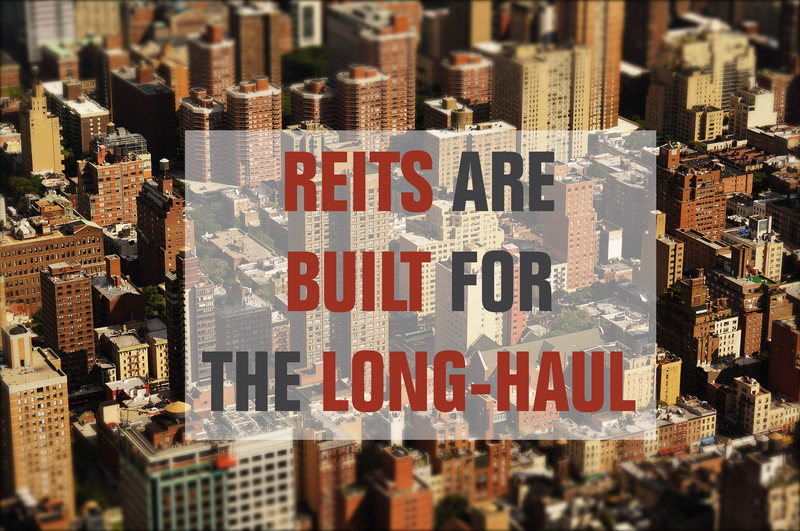 REITs are mostly known for their higher distribution and stable business. By distributing 90% of their profit, REITs are by far the #1 income seeker’s choice. Real Estate Income Trusts offer a wide diversification over several sectors. Here’s the REITs dividend stocks list. I remember when I was a kid, my parents owned a 4-plex. As an 8 year old child, I found it fascinating to receive money each month without “doing anything”. As I grew older, I realized that taking care of Real Estate wasn’t exactly passive income. You do receive your checks monthly, but you also have maintenance work and you have to take care of your tenants. I guess this is why Real Estate Income Trusts are so popular; you get the checks, but you don’t have to deal with any of the hassles of real estate ownership. REITs are not only popular because they distribute generous dividends, but also because they are easy to understand. Investors can picture an apartment building or an office tower and see how tenants pay their rent monthly. They are willing to purchase units of those businesses in exchange for income and a peace of mind. This article explores this sector, defines how it can boost yield in your portfolio and provides you with a complete dividend stock lists including comprehensive metrics. The concept of being a landlord and having tenants is comparatively simple to understand. The company owns and manages Real Estate in exchange for receiving rental income from properties such as apartment complexes, hospitals, office buildings, timber land, warehouses, hotels and shopping malls. The majority of REITs are equity REITs. They must invest the majority of their assets (75%) into real estate or cash equivalents. In other words; they cannot produce goods or provide services with their assets. This is how REITs must also receive 75% of their income from those real estate assets as a form of rent, interest on mortgages or sales of properties. REITs must also pay a minimum of 90% percent of its taxable income in the form of shareholder dividends each year. Therefore, classic earnings per share and dividend payout ratios cannot be considered to gage the health of an REIT. We will detail how to analyze REITs in the characteristics section below. As you can see, you can build a list of 7 different REITs and have a well diversified portfolio already! What REITs Stocks Can Do For Dividend Investors? Since these businesses must distribute 90% of their profit to shareholders, you can imagine how most of them offer a relatively high dividend income. This is one of the rare sectors where you can find “relatively safe” stocks paying 5%, 6% even 7%+. Investors must be careful not to get too greedy, though. We have seen several REITs cutting their dividend due to poor management or economic downturns. While you may enjoy a comparatively high yield, you must not forget about inflation. Many REITs don’t increase their payouts for several years in a row. This means that each year, your income is being reduced by 2-3% if you consider the affects of the inflation rate on your retirement plan. REITs usually bring stability in a portfolio along with higher yield. This is definitely a great sector to start with when you are looking for additional income. Real Estate brings a great diversification to your portfolio. Research has proved that REITs are not directly correlated to stock market movements over the longer term. The REITs Dividend Stocks list is being updated on a quarterly basis. While REITs are part of a short list of sectors that are perfect for retirees or other income seeking investors, it is important to understand they cannot be analyzed with the same metrics as other sectors. The Funds from Operations and Adjusted Funds from Operations FFO & AFFO are probably the most useful tools to analyze a REIT’s financial performance. Those two metrics replace the earnings and adjusted earnings for a regular stock. While it’s different metrics, it’s all about cash flow and the REITs ability to sustain their dividend payments. Fortunately for us all, we can find those metrics (calculated already) inside each REITs quarterly report and susequent press release. It is important to not only follow the (A)FFO in general but also to follow the (A)FFO per unit of ownership. One of the REITs’ favorite way to finance their new projects is to issue more units. Therefore, if a company purchases a property generating $20M per year, but needs to issue more units to finance the purchase, you must look at the net outcome for unitholders. If the FFO per share drops, this is not necessarily good for you as it will affect the REIT’s ability to increase its dividend in the future. Another way for REITs to finance their activities is obviously by mortgaging their properties. As their assets grow in value, REITs can remortgage them and gain access to additional money to purchase more properties. You certainly don’t want to invest in a REIT showing a high LTV. This means that their credit rating may be at risk and the price for future debt will be higher. In other words; less money for your dividend. The last metric you must follow that is specific for REITs is the Net Asset Value (NAV). The NAV (usually shown by units) can be translated to the equivalent of a Price to Book ratio. The idea is to compare a few REITs from your list against one another. This is how you should be able to find the ones with the best metrics. A lower than industry NAV is either a riskier play or a value play. The AFFO and LVT will tell you which one it is. EPR is specialized in Triple Net Leases. This is when the tenant agrees to pay all real estate taxes, building insurance, and maintenance in addition to normal fees expected under the agreement (rent, utilities, etc.). EPR shows 400 locations rented by over 250 tenants for a total asset book value of nearly $7 billion. EPR’s main business is focused on entertainment (156 megaplex theatres, 11 family entertainment centers), recreation (31 golf complexes, 25 ski areas, 20 attractions) and education (65 public schools, 14 private schools and 67 early childhood education centers). Chartwell Retirement is the largest pure-play in Canada’s senior housing market. The REIT operates a complete range of seniors housing communities, from independent supportive living through assisted living to long term care. It is the largest operator in the Canadian seniors living sector with over 200 quality retirement communities in four provinces. CSH are the only owners of about 70% of those properties. The other 30% are under various partnerships. Granite REIT owns and manages industrial properties in North America (Canada + USA) and Europe (7 countries). It owns 92 properties ($2.7 billion in value) for a total of 30 million square feet. While the company shows a total of 37 well-known tenants (Cardinal Health, Siemens, DHL, Mercedes-Benz, Samsung, Sears (oops! )), 77% of GRT revenue comes from a single tenant: Magna International (MG.TO / MGA). While Magna is a solid company and is part of our DSR portfolio, we don’t think a business model so dependent on the success of another single business is a strong strategy. National Retail Properties is a Real Estate Investment Trust (REIT) providing long-term leases to retail clients. NNN owns 2,543 properties across 48 states and 38 different fields of operation. As opposed to many other “pure retail” REITs, NNN’s tenants are involved in industries that are relatively sheltered from the online competition (like convenience stores, restaurants and entertainment). 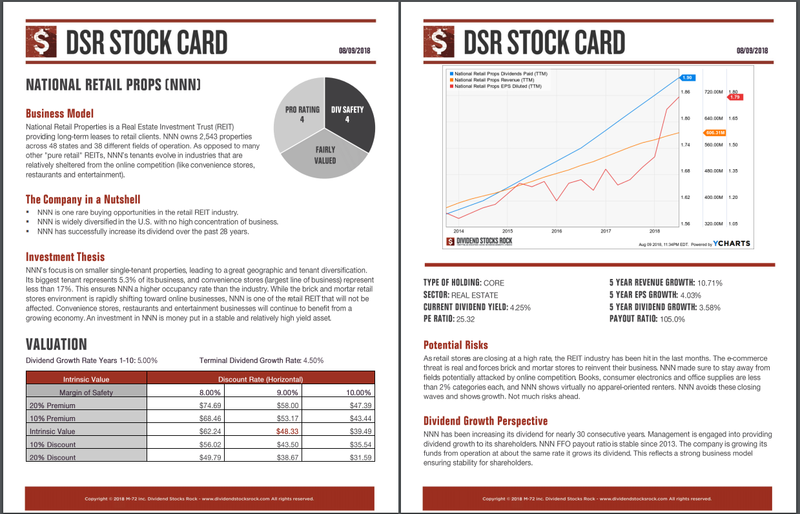 On top of providing sector lists, we also provide stock cards for each company we follow. Here’s an example (click on the image to enlarge). If you liked the REITs dividend stocks list, but you are looking for additional sectors, you can register for our free newsletter and receive exclusive access to all our sector dividend stock lists. For each industry, we cover both U.S. and Canadian dividend stocks.